So, you’ve been going to fitness studios for a while. Maybe you are a regular at the gym. Perhaps you’re just getting started. Regardless of where you are in your fitness journey you have most likely heard some new terms, acronyms or jargon that sound cool but you still don’t understand what they mean. (AMRAP, HIIT or TABATA to name a few). It’s easy enough, you follow the instruction of the trainer or coach, but aren’t you a little curious? Have you been afraid to ask? I want to simplify this so that everyone can understand what they mean and what the benefits are, so you can feel empowered by your workout! OK, if you have been coming to STRIDE you have heard this on a daily basis I’m sure. But let’s look at it from a health perspective. This training strategy is a technique in which you give an all-out, 100% effort through quick, intense bursts of energy, followed by short, sometimes active, recovery periods. This type of training gets and keeps your heart rate up and burns more fat in less time. 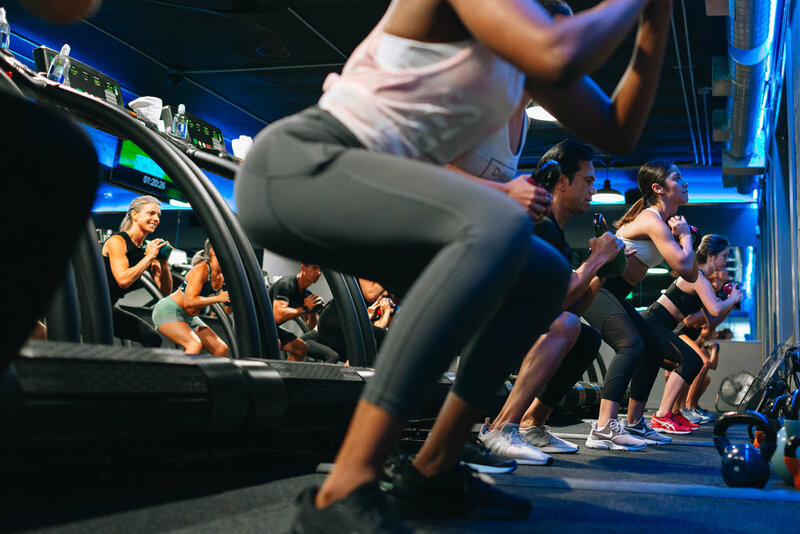 A HIIT workout increases the body’s need for oxygen during the effort and creates an oxygen shortage, causing your body to ask for more oxygen during recovery. We are working the heart muscle trying to get it stronger with repeated efforts. We do HIIT efforts on the treadmill by pushing speed and/or adding incline. This is also known as (EPOC) excess post-exercise oxygen consumption. This is the reason why HIIT style workouts will help burn more fat and calories than regular aerobic and steady-state workouts well after you leave STRIDE. This style of workout was created by Dr Izumi Tabata in 1996. A TABATA exercise series are designed to increase metabolism and improve anaerobic capacity. It is referred to as a ‘miracle’ workout, because of the amount of energy you can produce during quick bursts of effort compared to those performed during longer workouts at less intense paces. This is a timed interval method that alternates between 20-second intervals performed at maximum effort and 10-second stages of rest, repeated multiple times for the ultimate exhaustive workout. It is a form of a HIIT technique. Tabata forces you to work above your lactate threshold, meaning your effort is painfully hard. Ok.. ok.. if it’s that hard, then what are the benefits? There are several. From being able to reduce fat, increase endurance, and maximize your workout efficiency. Some examples of Tabata style exercises are jump squats, high knees, jumping jacks and mountain climbers. This is a regular STRIDE term. I mean, our class is called “Power BURN” after all! You hear if all over the fitness industry “feel the burn,” but what is happening here and why do we want to feel it? When doing strength training moves and you complete more and more reps, your muscles begin to fatigue. Your body then responds by producing lactic acid, which causes that tingling, heavy, or burning sensation, this lets you know when your muscles have had enough. It's a good thing that you're feeling this sensation, because it's a sign that your muscles are being challenged, which makes them stronger. Just be sure to listen to your body. Too much pain can be a warning sign your muscles need a rest. A great way to assist in muscle recovery and to fight loss of muscle is by using a BCAA (Branch Chain Amino Acid), rest, and of course hydration is key. Also known as ‘Jump Training’, Plyometric exercises exert maximum force in short intervals of time. The goal is to increase power, speed and strength. This training focuses on learning to move from a muscle extension to a contraction in a rapid or "explosive" manner. You are probably familiar with the exercises associated with ‘Plyo’ , such as squat jumps, tuck jumps, box jumps, lunge jumps and lateral jumps. This exercise is great for challenging your fast-twitch muscle fibers, coordination and agility. It can really spice up your cardio workout and create a new challenge for your muscles, nerves and tendons. What’s the big message here? Understanding the workout and terminology just makes you a switched-on exercise enthusiast. This can help craft your workout plan and maybe provide some ideas for improvement and better results. At the end of the day, you should always listen to your body, take recovery days and take a break when you really need it. Over time, you’ll need less rest and you'll be able to keep the intensity up for longer and get better results.